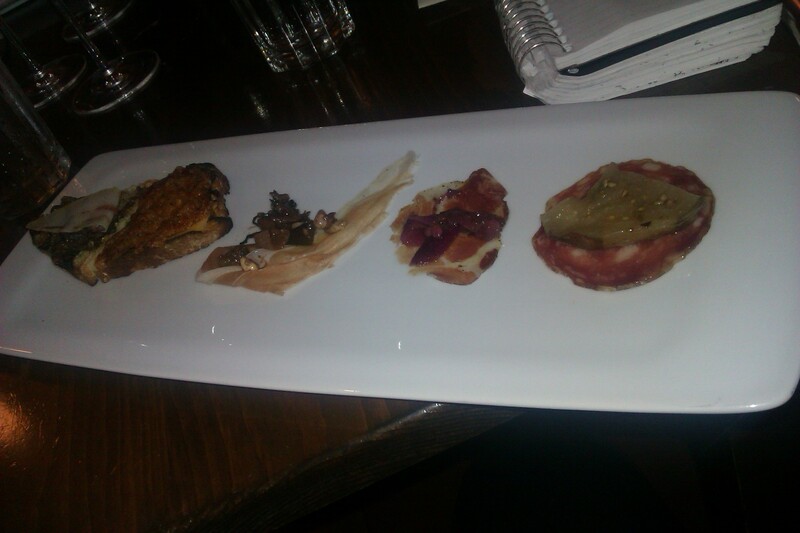 The charcuterie course comes via a single, long plate. The housemade salami brings a robust flavor and mild fattiness to a creamy eggplant oreganata, while the pairing of a beautiful oval of capocollo topped with sweet and sour onions is much more pleasantly jarring. Even this is outdone by the crostino of n’duja, a spread of soft salami aged for only 3 months—rather than the hard salami standard of 6. As Cicala promised, it delivers an unexpected, yet welcome heat, thus reinforcing the genius of being able to continuously reengage and challenge diners during such an affair. The matching wine, a Cerasuolo which has taken us off into rosé territory, has both more body, along with a sharpness to cut through the fat and inflect both spice and sweet. The Cerasuolo is an appropriate precursor to the reds that follow the next three stanzas as they all come from the same grape. Winemakers give the former its namesake cherry color and fruity flavors by whistling the grape skins out of the pool early, thereby preventing a buildup of tannins. “This is entry level, the equivalent of a table wine,” the waiter says as he pours the first Montepulciano d’Abruzzo, the wine finally catching up with the day in transitioning into darker territory. “It goes up in boldness and complexity from here,” he says, before buzzing off to continue the dance of filling a fleet of wine glasses with the other servers. Just as I try again to count where I’m at—how many glasses/bottles?—l see it. It’s both beautiful and quixotic. It has the power to heal. It is love. I want to run my fingers to its domed apex, over its two-tone course with paler swaths breaking up a predominantly burnished complexion. I want to make love to—then I realize it knows that. It knows everything. My eyes, my being brimming with love, I apologize. That’s okay, Timballo says with all its oven-baked warmth. And then, to cement our telepathic bond, we hug from across the room. 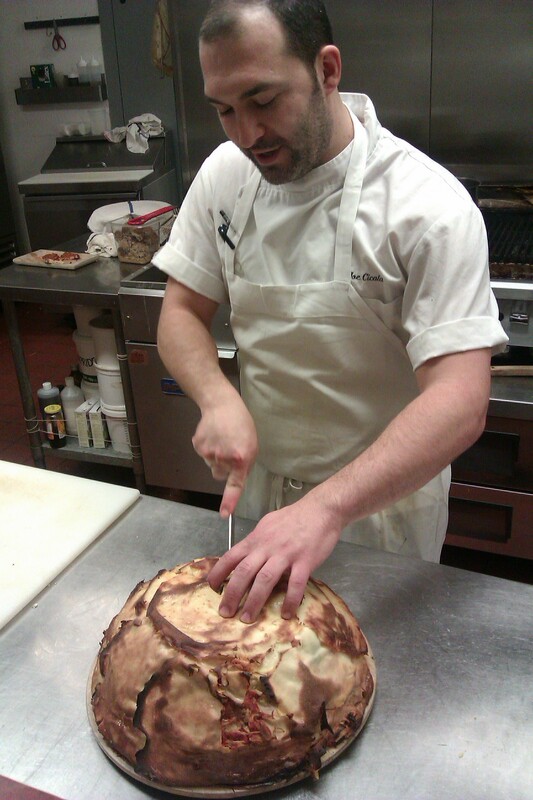 This as Chef Cicala presents the nearly foot high timballo on a wheeled wooden block. Cell phone cameras flash. We each do our part in voicing the collective awe. Perhaps no one—other than the timballo—reads the mingling of lust and love in my eyes. Perhaps I’m into my third bottle by now. 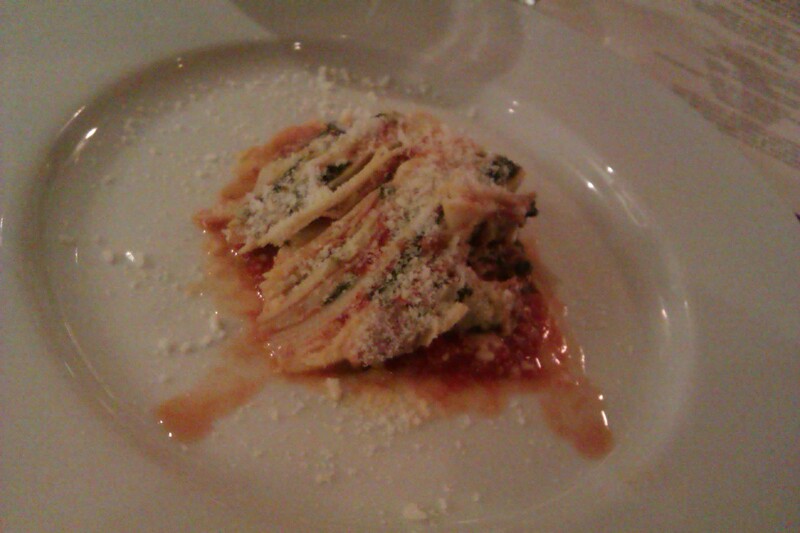 The layers of crepes speak in delicate whispers, the ricotta, spinach, tomato sauce, and sprinkled pecorino all as soothing as the pillowy texture, with the tannic elements of the wine rising only to the restrained amplitude of each ingredient. A similar lightness in the homemade pastas—taccozzelle, maccheroni, gnocchi—and the sauces that follow helps as much as the portion size. While I finish two plates barely touched by newfound friends during this stanza, besides my own gluttony, that’s more a testimony to the perfection Cicala reaches while still exhibiting said restraint. The portions definitely aren’t too small. Etiquette is simply not a concern in the face of such amazing food. And it’s well past 7 o’clock by this point, so by shared experience alone, none of us are strangers. There could be no complaints of skimping on flavor in sauces that match the balance seen in the portion sizes, the pasta. The lamb and wild boar ragus (2nd and 5th courses) are kept light, yet still robust, via vegetable, brothy components bursting with flavor. What seems a sublime sausage porcini béchamel accompanying the taccozzelle (3rd course), is balanced further via floral notes of saffron and earth redolent notes of black truffle. The sugo (sauce) teramana in which the maccheroni (4th) luxuriates, conveys the freshness of tomatoes (in December! ), rather than that of a tomato sauce left to simmer with rib sticking pork juices, with this sense aided by carrot and nutmeg—and red pepper flakes. “I love the heat,” Jurdjevic says. The heat echoes that of the soft salami of the previous course, while preparing us for the mild traces we’ll get in the porchetta of the ensuing meat courses. 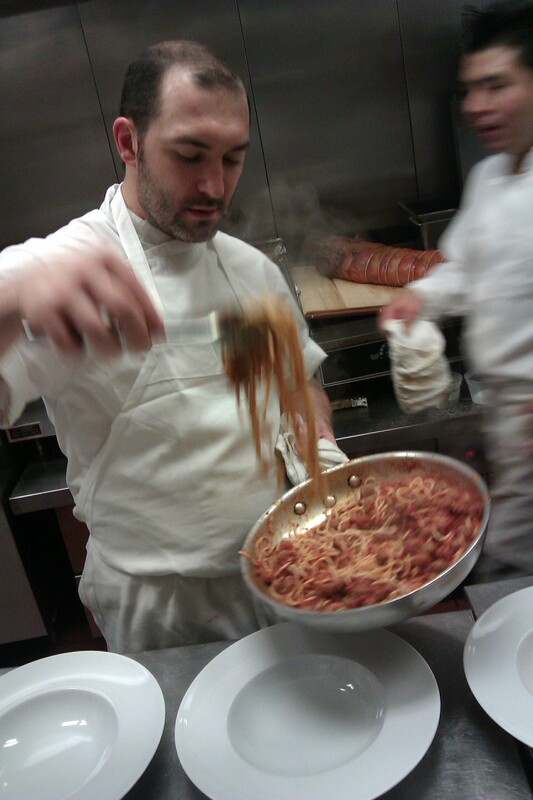 Plating the maccheroni alla chitarra. The meatballs in this dish—“the only old world dish where you’ll find them,” Cicala says—are half-dollar size and lean, yet redolent of their component black pepper and cheese seasoning. The heavy sprinkling of pecorino enlivens rather than pushing the composition over the top—particularly with the wine’s help. Another requisite dish, it gets it name, maccheroni alla chitarra, via the metal stringed instrument that cuts the pasta. In the last dish of the stanza, the sweetness of the chestnut gnocchi along with that of the wild boar ragu combine to enthrall, rather than to overwhelm the palate. 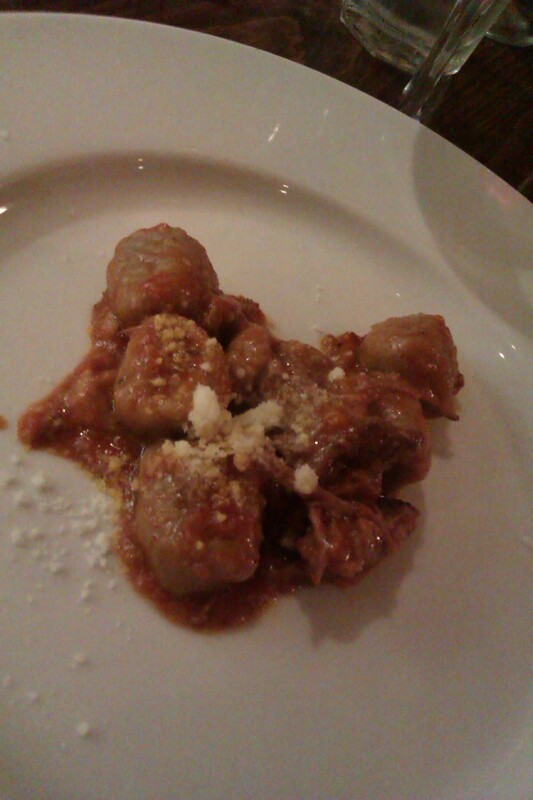 Chestnut gnocchi with wild boar ragú.